Everyone knew it was impossible to do. One day, someone who did not know showed up and did it. Part 1: The first problem it aims to solve is higher efficiency conversion of solar radiation to electricity. To accomplish that, sunlight, containing multiple wavelengths, will be converted to photons of a uniform wavelength and heat from the conversion process will be converted to electricity or light as efficiently as possible. 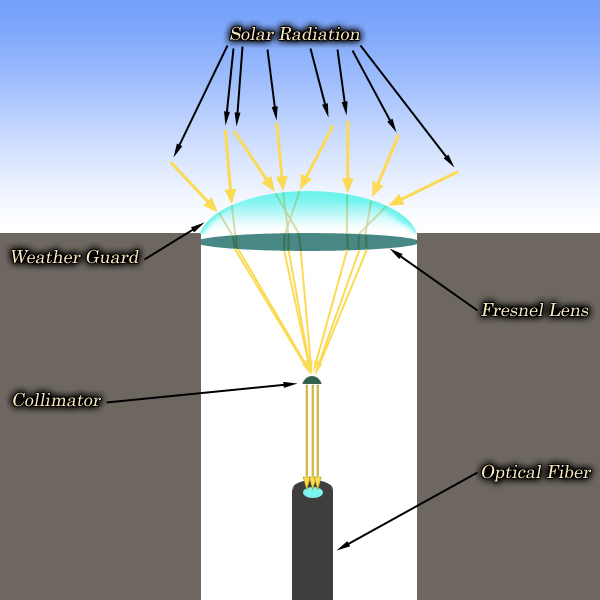 Sunlight will pass through a transparent weather guard with an anti-reflective coating, and hit a Fresnel lens which will focus the light onto a second lens or mirror that collimates the tight beam. The collimated light will be focused into a fiber which will input the light, on a looping trajectory of total internal reflection (TIR), into the crystalline core. The crystalline core is a tube with a polygonal cross-section that is formed into a semi-circle. It will be made of a material that best balances cost, structural integrity at high temperatures, and transparency to all wavelengths of solar radiation. A mirror coats the inside walls of the core, and a liquid coolant is able to flow through the hollow center. Surrounding the outer walls of the core is a very thin mesh-pattern layer of material that radiates photons of a desired wavelength when heated. Holes in the thermal radiation material will be situated where most of the light in the TIR trajectory will reflect off the planes of the outer core wall. Finally, a laser gain medium with a lower refractive index than the core material that emits photons of the same wavelength as the thermal radiation material will surround the crystalline core. 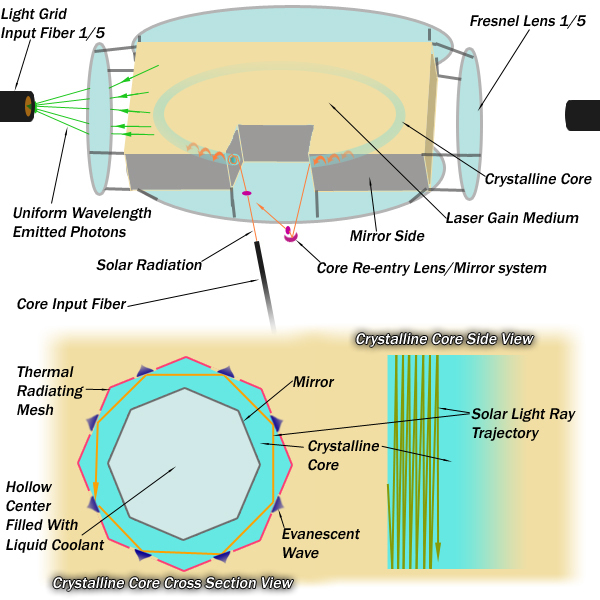 The delivery fiber will input the focused and collimated ray of solar radiation into the core. The trajectory will be helix-like totally reflecting off of each plane as it spirals through the core. Upon exiting the core, a system of lenses and/or mirrors will redirect the ray back into the entry point. Photons will remain in that looping trajectory until they have been scattered and/or absorbed into the core. Each time the ray totally internally reflects an evanescent wave will propagate into the gain medium exciting nearby atoms causing population inversion and spontaneous emissions (and allowing for stimulated emissions) of photons. The side of the gain medium where the ray of solar radiation exits and reenters the core will be coated with a mirror reflecting photons back into the gain medium. Photons exiting the gain medium through the other five sides will be focused into optical fibers made of a material that transmits that wavelength with the lowest loss. Those five fibers will input the photons (all the same wavelength) into the Light Grid. Part 2: The second problem this idea aims to solve is storage. Everyone else seems to be focused on batteries or alternative storage technologies. To meet the same objective of continuous electricity output regardless of the time of day and weather conditions, I wondered if there was a way to route the solar radiation from areas of supply to areas of demand. Sunlight is in constant supply at all times on a large portion of our planet, but locally installed solar panels (or other solar harvesting technology) don't take advantage of that continuous supply. The continuously supplied light in the grid will be harvested by electricity suppliers. Mirrors will temporarily direct the light into a harvesting loop. 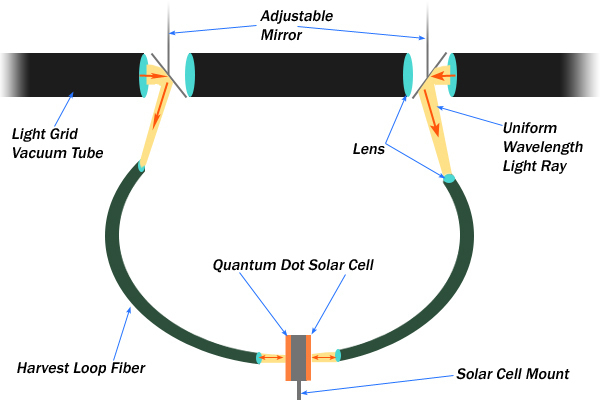 Light in the loop will be focused onto a quantum dot solar cell tuned for maximum efficiency for the wavelength of light being harvested. Some of the light that reflects off the solar cell will reenter the grid traversing the opposite direction. In order to maintain continuous supply in the grid while multiple systems simultaneously harvest the light, software to synchronize harvesting and multiple grid tubes will have to exist. I understand that this Light Grid system will be extremely expensive to build, but it may solve the storage problem. It would also eliminate the need to cover so much surface area with silicon (or other, more expensive) photovoltaic cells. If you (or someone you know) can improve this idea or prove it wrong, then please do so. If this idea is a viable improvement to current solar technology, then hopefully this post will serve as prior art so anyone who wishes to use part or all of the idea may freely do so. Thank you for your time. Converting the light to a single wavelength will greatly increase efficiency when utilizing a quantum dot solar cell which can be tuned for maximum efficiency for a specific wavelength. A sterling engine, thermal radiation, or better process will be utilized to harvest electricity from heat. I haven't researched this enough to know which is best. If the electricity produced by heat exceeds the local demand, then a thermal radiation process to input more light into the grid may be a better option. If the heat is too intense, the area of the Fresnel lens can be divided into an array of smaller lenses that focus the light into separate delivery fibers and core systems. If it is cost effective and more efficient to divide the wavelengths using a prism, diffractive grating, or thin-film interference application, then the more organized wavelength groups can be input into core systems surrounded by thermal radiating meshes and gain mediums whose photon outputs are within the wavelength group. This would take advantage of the quantum tunneling photons to help pump the laser. The mesh-pattern is so that some photons radiated away from the gain medium can reflect back through and into the gain medium. Holes at the sites of TIR are there so that evanescent waves caused by the TIR can be directly absorbed into the gain medium without bypassing a buffer layer. This will maximize photon emissions pumped by the evanescent waves in the gain medium. Some of the photons will tunnel and be absorbed into the gain medium or stimulate emissions as well. The most efficient single-mode optical fiber will only transmit the photons up to ~1,500 km before they are completely absorbed. 1) From feedback so far, I've learned that the fiber optics I'd incorporated into the system will likely absorb photons too quickly to be an efficient solution to transport focused light from an origin to a destination along a non-straight path. Instead, using mirrors to redirect focused beams within an enclosed near-vacuum space would probably be better to accomplish that objective. I worked in a CPV(Concentrated PhotoVoltaic) start-up. We used Fresnel lenses printed on cheap, rigid, inflatable substrates to focus highly concentrated light on very high efficiency multi-junction cells(with real-world efficiencies of >40%), using high precision independently tracking platforms. A few points: * Simplicity is success, the more complicated your process is, the more likely it will failure. Our rig was complicated, but you proposed solution is much much more so. * CPV is the leper of the solar industry, nearly every player in the CPV space is dead or dying, and most VC's avoid it like the plague. * With any high concentration CPV system, you will not generate power and potentially melt/destroy your rig if you do not have an accurate tracking system, which are expensive and often require constant maintenance. * Quantum dot solar cells basically don't exist outside of theory. The highest efficiency I've heard coming lab examples is somewhere below 10%. Multi-junction cells, although expensive, do exist and are obtainable(spectrolab, etc). * Every time light reflected or otherwise interacts with a non-vaccum medium, it loses energy. CPV system should be designed to interact with the light as little as possible, while the above design seems to maximize interaction. * Module costs are in constant decline, unpredictably so, so it is extremely dangerous to build any business module based on current 1 sun panel prices (see solyndra). * There are massive infrastructures in place to deliver electrical energy, while very few to deliver light energy, and none at all to deliver this sort of high energy light. In short, it would be far more technology and economically efficient to deliver power to areas remote from the generate site by converting it to electricity. * In reference to your comment related to shifting the light to a specific frequency: It is very difficult to shift the frequency of light, and there are losses and limitations ( see raman shifting). If you could design a system to shift wide band EM radiation to a single band, cheaply, without significant losses, you would have revolutionized no just the solar energy section, but a great many other industries as well. I have seen primatic systems which split light into different bands, each which are channelled to a solar cell with a matching band gap, but once again, the cost and loss made this approach uninviting. * In short: How does this unit track the sun, as that's the first hurdle to handle with any CPV solution. Then what are your optical losses? What's LCOE can be expected from this sort of design and how does that compare to a 1-sun type module bench mark. What are the benefits of this design of current designs? Hopefully I'll be remembered either as a great father who made substantial contributions toward improving our world, or as a great father who worked very hard on his projects. I've learned enough to realize how little I know, so please take advantage of any opportunity to enlighten me. I can be contacted via email at: my first and last name separated by a period at gmail.